What is condensation and why is it a problem now? One of the biggest points of confusion for homeowners, tenants and landlords suffering from mould in their property is the cause. Black mould on your walls is likely to be the result of condensation and high humidity. But what exactly is condensation, and why does it seem to be much more common now? Our MD Bryan Hindle briefly explains “Our modern lifestyle differs greatly from that in the middle of the 20th century (when most houses were built). People back then didn’t have the luxury of hot water 24/7, at the flick of a switch. Showering every day was unheard of, most people wore the same shirt for several days – rather than changing every day, as is common now. All this extra laundry and washing creates a huge amount of water vapour. Houses used to have open chimney flues and draughty window frames – they didn’t have double glazing and were well ventilated – water vapour didn’t build-up and mould was only ever found on cheese and bread. The rush to save energy means those chimneys are blocked-up and our houses are nowhere near as draughty as they were – in fact we strive to make them airtight. The growth in mould and condensation problems is a direct result of these changes“. We’ll carry out a thorough damp survey to establish the real cause of the problem. This will include a detailed assessment of the ventilation and heating regime, as well as a full inspection to find any underlying factors. Our qualified and experienced damp surveyors will get to the bottom of the problem for you. We have a thorough understanding of the science of the indoor environment. We’ll provide a written report, with clear advice on what is causing the mould and how to get rid of it for good. Our qualified thermography experts use the technology to ‘see’ condensation as it happens (a private residential let in Leeds). Advanced internal and external environmental monitoring using the latest state-of-the-art equipment, enables us to see what is really happening. We also have thermal imaging cameras, hygrometers, calibrated air flow anemometers and the best available moisture meters too. Together with our surveyors skill, these tools allow unrivalled technical appraisal of damp houses. We’ll ask you lots of questions to find out how you want to live and what needs to be done to enable that to continue, without the mould and condensation you’re putting up with now. If required, we’ll give you a no obligation quotation for installation of the latest and most effective ventilation and air quality equipment, including energy efficient extract fans and whole house ventilation systems. Single room heat exchangers are also available to extract damp air and recover the heat which normal extract fans lose. We specify, install and commission ventilation equipment in accordance with the Building regulations (part F – means of ventilation), so that you know everything is working properly. Our surveyors are independently examined on their knowledge, each having passed the bpec domestic ventilation engineers examinations. We can accurately measure the performance of your existing extraction equipment and also ‘fine tune’ new equipment for the needs of your home and your family, ensuring that your whole house ventilation level is fit for purpose – not too much – not too little. Your mould wont come back. Pr-installation and post installation monitoring is available. You can see the improvements in digital form if you want to demonstrate the effects to domestic or commercial tenants. For example, here’s an image of a data plot demonstrating the reduction in humidity following installation of a Positive Input Ventilation system for one of our clients. We also have the qualifications and experience to help in legal cases (or help avoid them), where disputes between tenants and landlords require expert advice and sound proven solutions. We are not ‘hired guns’ who favour one side of the argument or another. We will always issue a factual, accurate and impartial damp report, so that both parties can rely on the advice we give and reach a satisfactory way forward. Condensation problems – some facts on black mould. Condensation can cause more problems than water droplets running down the inside of your windows on a cold winter’s morning. The biggest problem is black mould – although despite the name it can sometimes appear green or white – which looks horrible, can damage decor and belongings, and isn’t great for your health either. 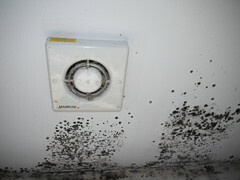 Mould is almost always the result of the internal environment… so what is wrong? Even if you get rid of it, it’ll keep coming back if you don’t treat the root cause! If you notice water dripping down, or sitting on your walls or windows, this is very likely to be caused by condensation, and may lead to (or have already caused) mould growth. So it’s clear – you can control mould growth by curing the condensation. No matter what the problems is, there will be a way to solve condensation and mould problems. Some of the advanced methods which are available can be explored on our Indoor air quality and ventilation service pages.